Walt Disney World is know for it’s Very Merry Christmas Party at the Magic Kingdom and Osborne Lights at Disney Hollywood Studios. In past years Disney Hollywood Studios was packed with holiday goers to see the spectacular displays as it was included in the everyday park admission price. Well in 2017 Disney Hollywood Studios has torn down the NY city streets that use to be decorated for Christmas so there paying for the Mickeys Very Merry Christmas Party special event is now your Disney World option. But there is an Amazing Christmas Party coming to Orlando Florida in 2017 that most people don’t even know about. I predict this is going to be the most successful Christmas event in Orlando. It’s at Universal Orlando Resort and will be at BOTH Universal theme parks. 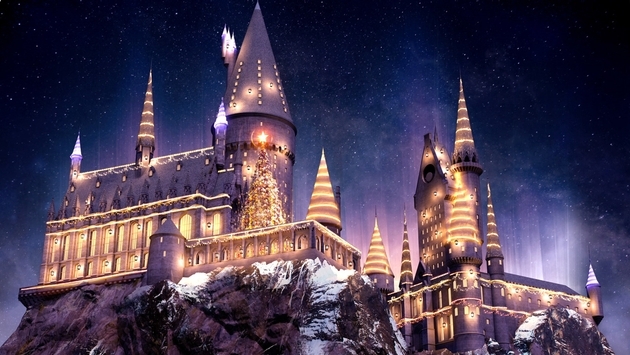 Celebrate Christmas in the Wizarding World of Harry Potter. If you have not been to see either Diagon Alley or Hogswarts at Universal Orlando Resort, they are stunning! Even more amazing these two immersive lands will be decked out for Christmas with no detail left untouched. From holiday treats, decorations, and entertainment. I am most excited about Hogwart’s Castle. There will be a reoccurring Christmas castle lighting that is like nothing you have seen before. Best of all the castle lighting happens several times a night so you don’t have to stake out a spot hours before. The Celebrate Christmas in the Wizarding World of Harry Potter is November 18 2017- January 6, 2018. Best of all the Celebrate Christmas in the Wizarding World of Harry Potter event is included with your regular park admission at Universal Orlando Resort. For the first time at Universal Orlando Resort, Christmas is coming to The Wizarding World of Harry Potter. by the Harry Potter series to life. during live concerts at Universal Studios Florida on Nov. 18, 19, 25, 26 and Dec. 2, 3, 9, 10, 16 and 17.
lightings, and Thanksgiving, Christmas and New Year’s Eve buffets. Orlando, live entertainment and endless decadent dishes and signature drinks. Tickets go on sale soon. Orlando’s theme parks including the new Volcano Bay water theme park. You can also upgrade your stay to include a Universal Orlando on-site hotel so you can enjoy exclusive benefits.